Ignazio Gardella was born into a family of engineers and architects. He followed engineering studies "Politecnico di Milano" and graduated in 1928. He graduated architect in 1949 at the IUAV (University Institute of Architecture in Venice). Gardella is at the top of Made in Italy architecture in the decade 60-70. It appears on many international journals, he becomes a famous architect through intense professional activity. After World War II, he was a major player in the cultural debate on the country's reconstruction. The Gardella technic is an architectural technic, that means, it does not find its origins scientifically, which is paradoxical from an engineer by training, before being architect. 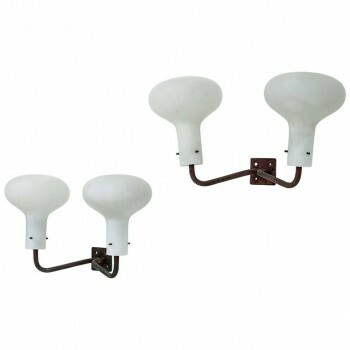 Ignazio Gardella, pair of sconces, opaline and metal, Azucena production, brand of the factory, circa 1950, Italy. Measures: Height 38 cm, width 60 cm, depth 25 cm. 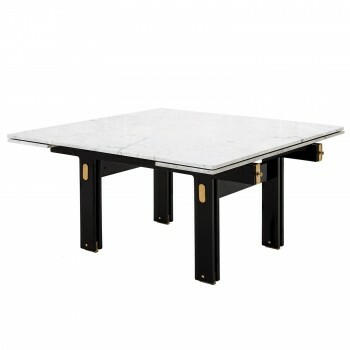 Ignazio Gardella, extendable dining table, Lacquered wood, brass and Carrara white marble-top, Misuraemme manufacturer, Circa 1980, Italy. Open table: height: 74 cm, width: 195 cm, depth: 130 cm, Closed table: height: 74 cm width: 130 cm, depth: 130 cm.